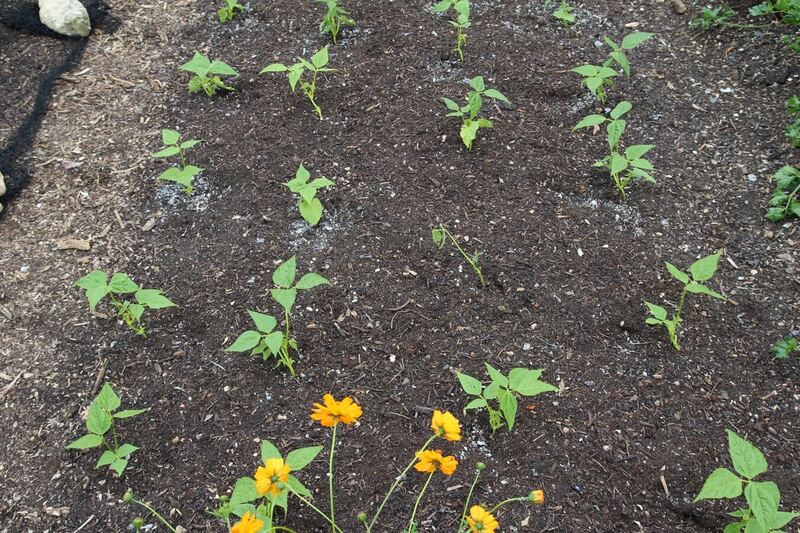 The season of second/successional plantings is well underway, see below. 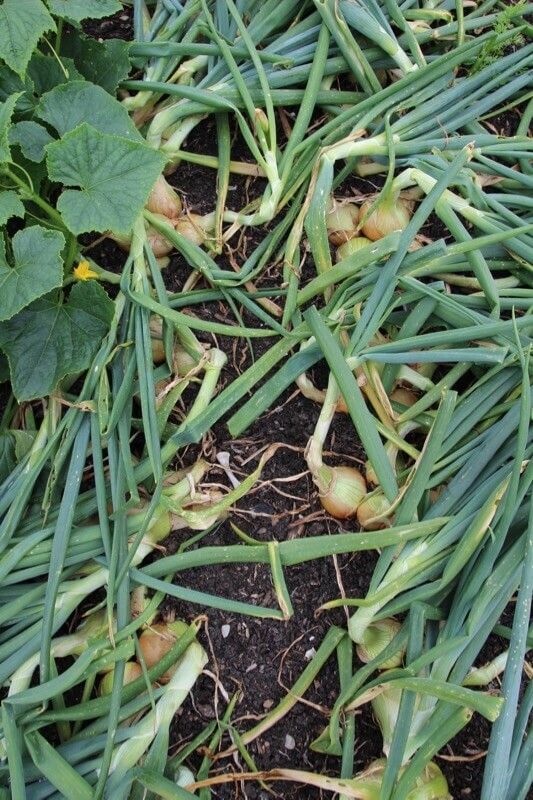 See how my first plantings were made, and the harvests they gave, in a new video. 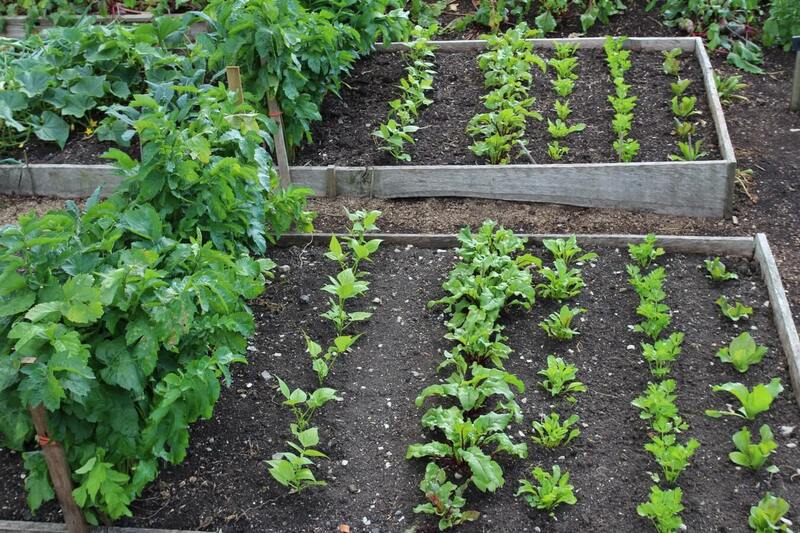 It has been an abundant season here so far, warmer than usual and with just enough rain for most vegetables except salads, fruiting crops and new plantings. 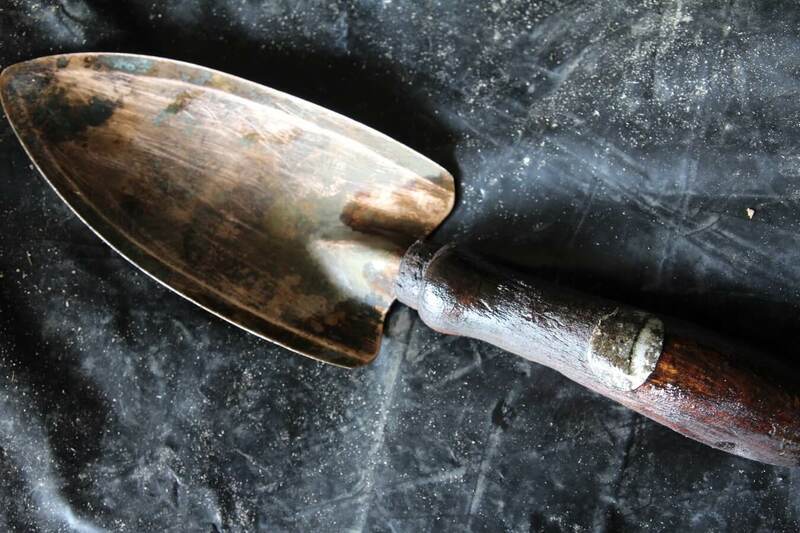 No dig helps hold moisture and means plants can forage deeper for it, as the soil structure is uniform with no ‘shatter zone’ from tilling, which can also cause drainage problems along the lines (as I understand it) of a perched water table. Steph was helping me harvest on 13th July and took the beetroot photo. They were watered in and have had no water since. If you managed the sowings I suggested in early July, there is a pause in sowing now. 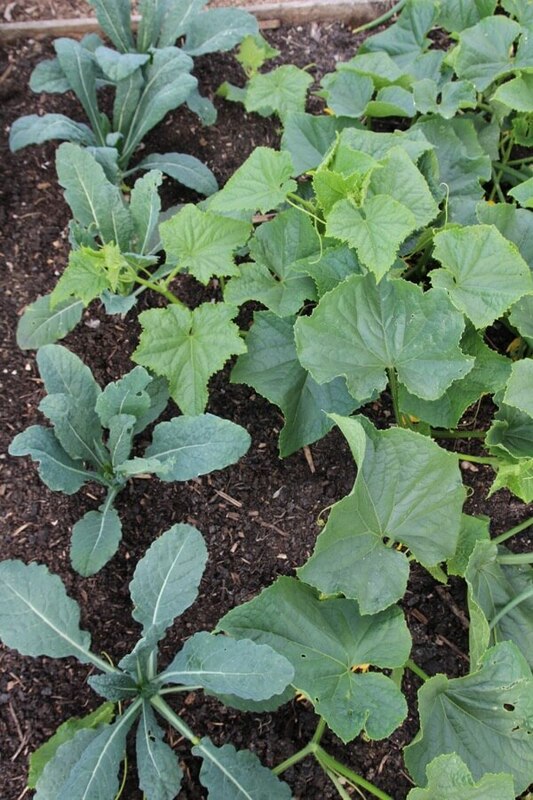 Or there is still (just) time to sow kale, spring broccoli, chicories for autumn hearting, and carrots in mild areas. Towards the end of July, if you fancy a challenge, sow Chinese cabbage for hearting in autumn. 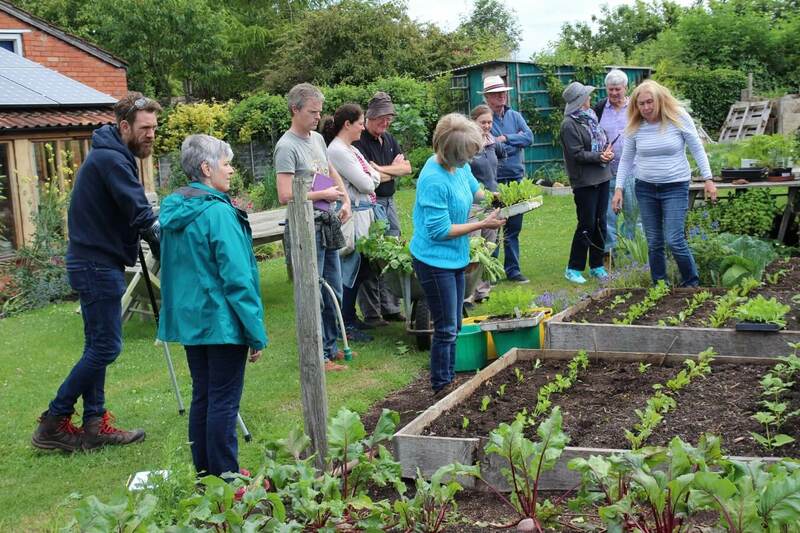 I had some help with new plantings on 1st July, as part of the day course. 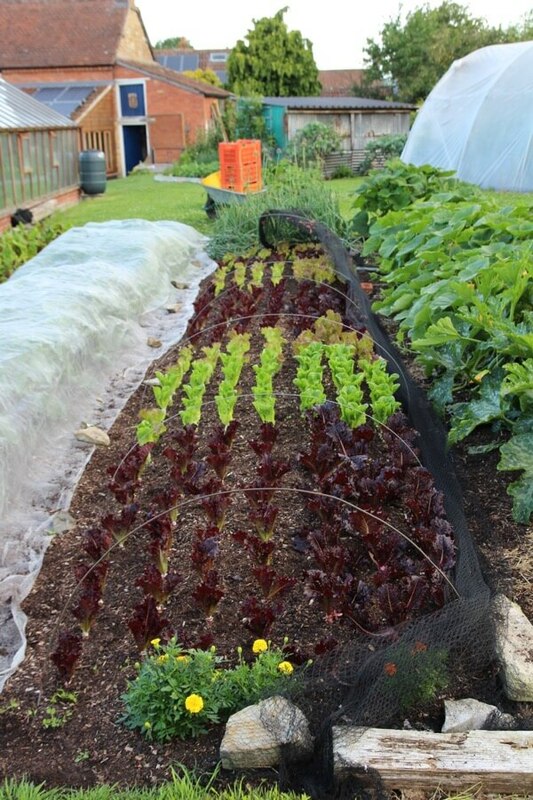 They pulled potatoes on the dug and no dig beds (for once the dug bed’s harvest was higher, see below) then planted beetroot, celery and radicchio. There are great possibilities, not so much in terms of keeping pests at bay, more about finding plants that coexist happily. 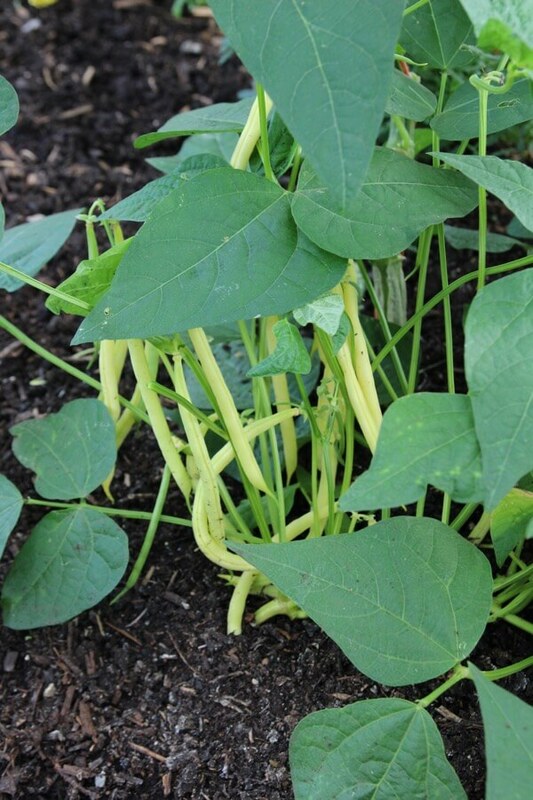 This summer I have had excellent harvests of dwarf French beans between and under cordon cucumbers in the polytunnel. 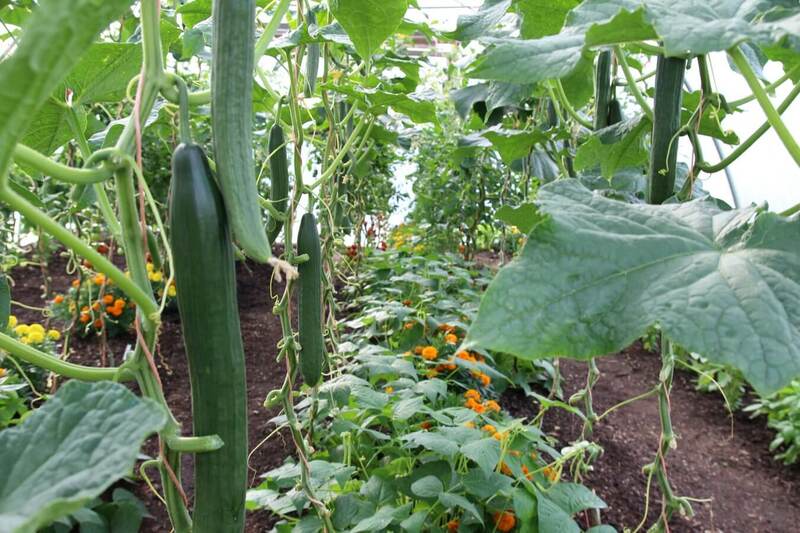 The cucumbers are well spaced, 24in apart and two rows in a 4ft/1.2m bed, also I cut off the lower leaves up to the lowest fruit. The beans have needed some extra water too, and I am interested that they tolerate so much shade. 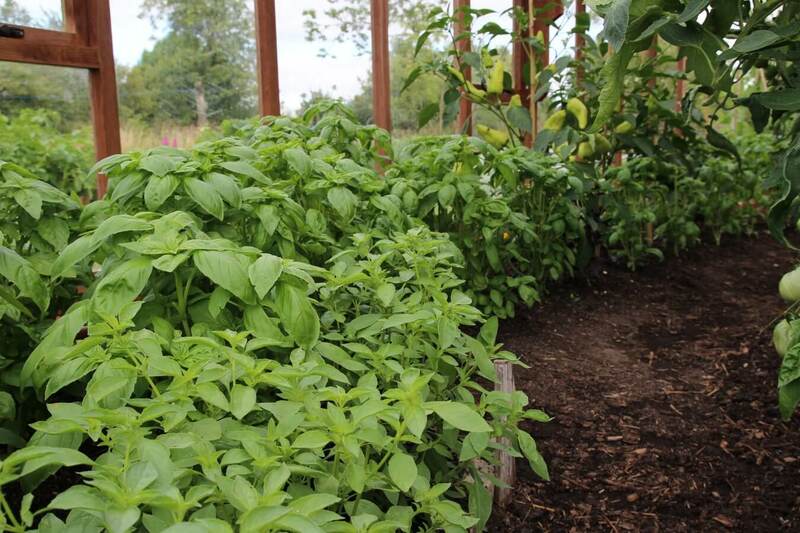 Basil with tomatoes is another classic, but again you need to water well. 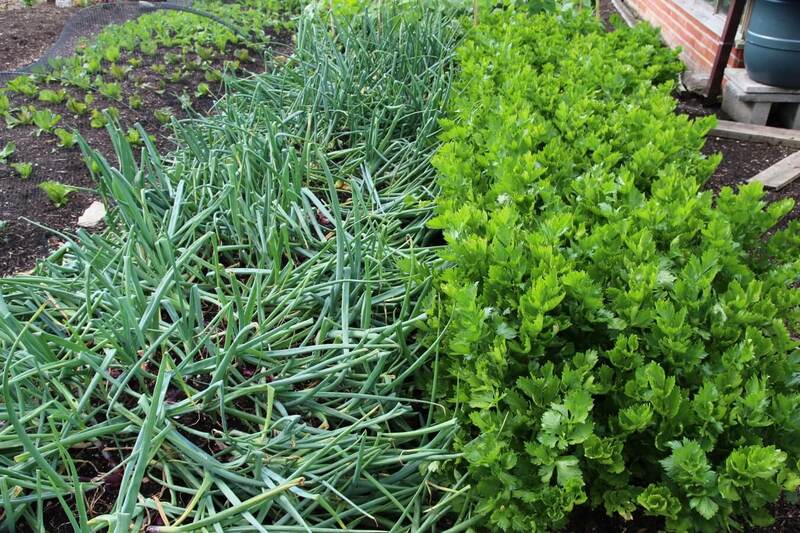 Planting friendly crops in adjacent beds is good too, such as celery and onions. 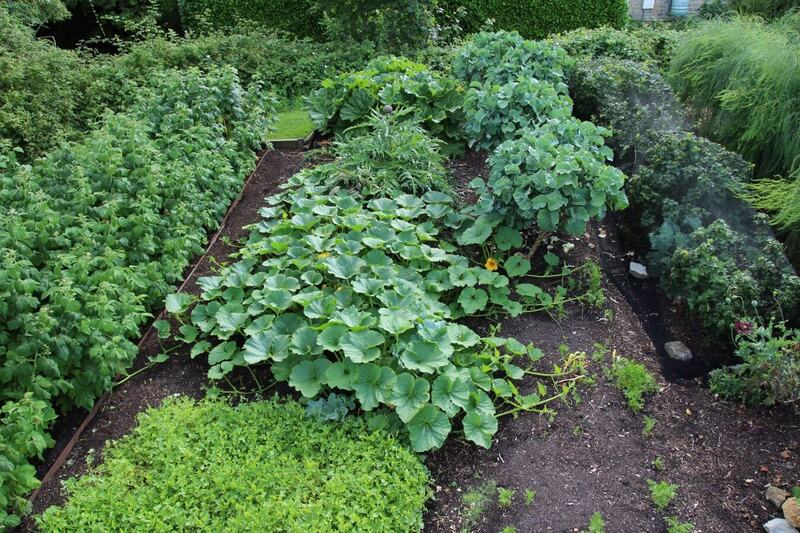 So many fascinating differences are always there, between same plantings on the dug and no dig beds, more info here. 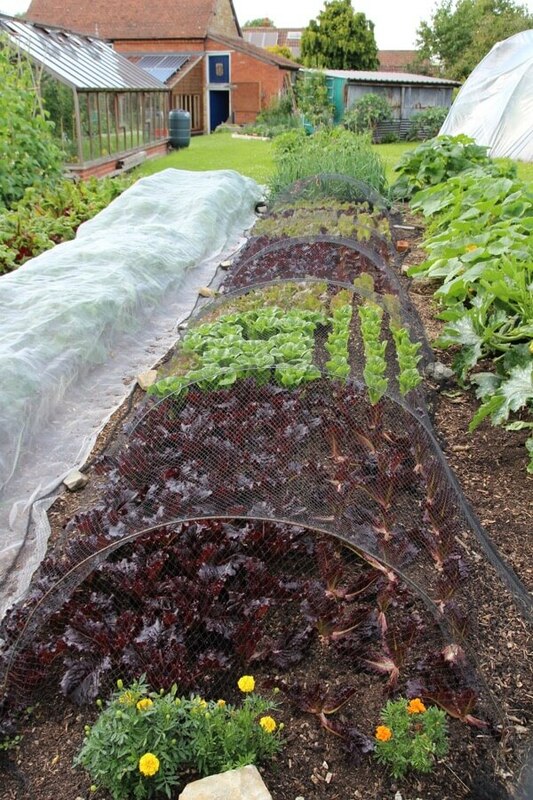 By mid July, the dug beds relative success with peas and potatoes helped it catch up from earlier failures of spinach and beetroot. 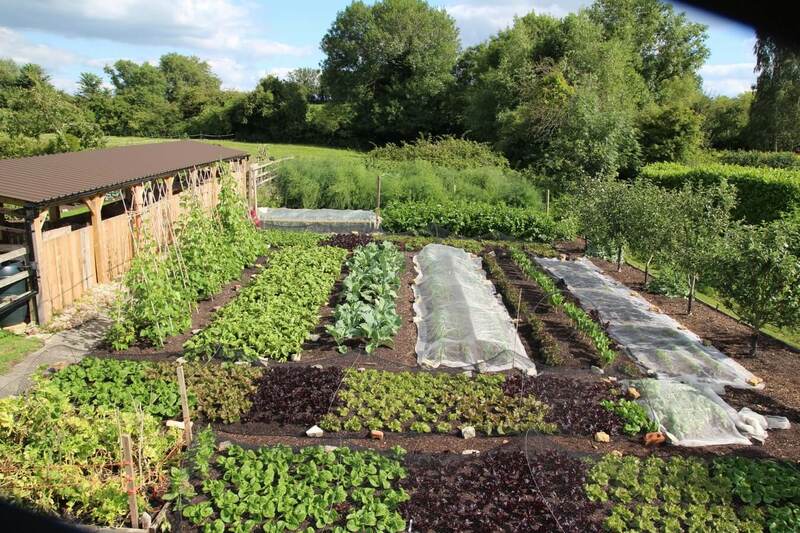 Harvests are 37.65kg/83lb dug and 41.16kg/90lb no dig. 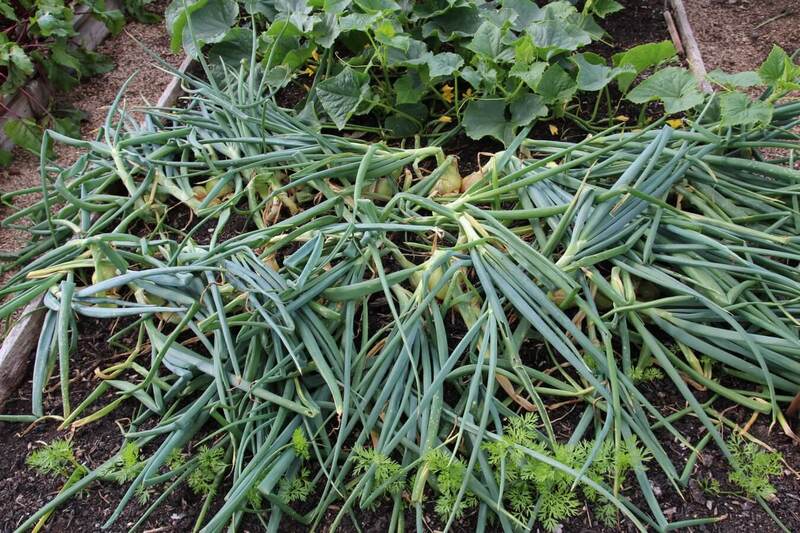 Onions and cucumbers are the next harvests. 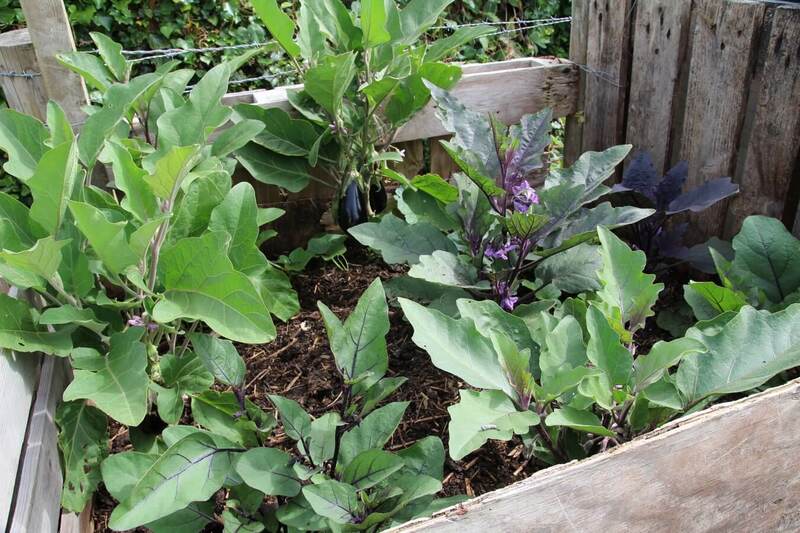 This bed’s plantings and harvests feature in the new video. Growth this summer has been my best ever, from sowing on 6th April, a leaf day on a waxing moon. 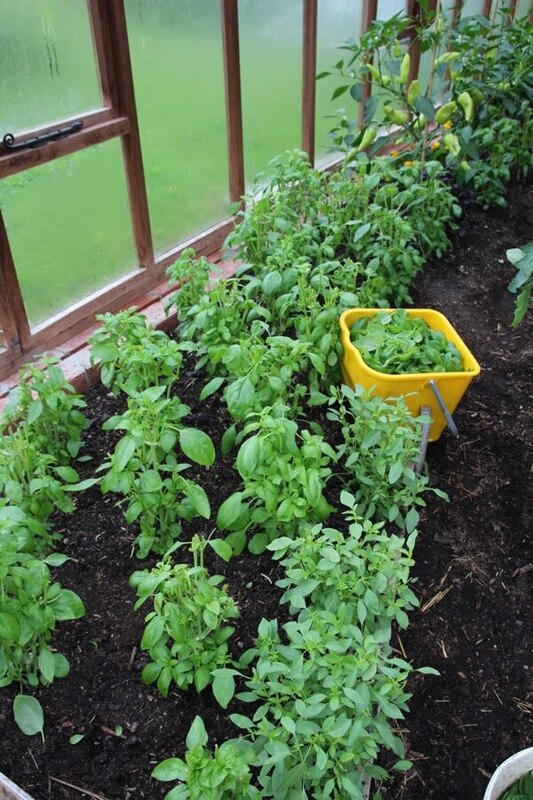 I kept the module trays over the greenhouse hotbed for the first six weeks, and carefully watered them so that the compost was never saturated, often half dry. 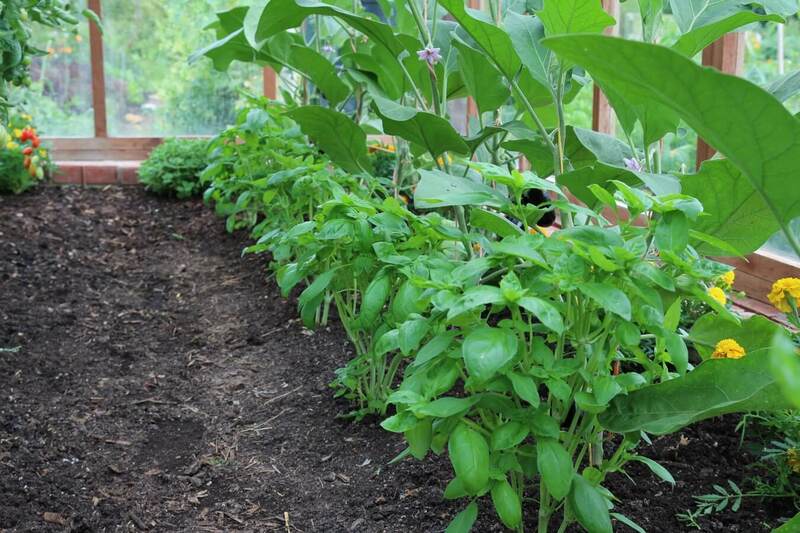 Many sowings of basil fail from waterlogged roots. 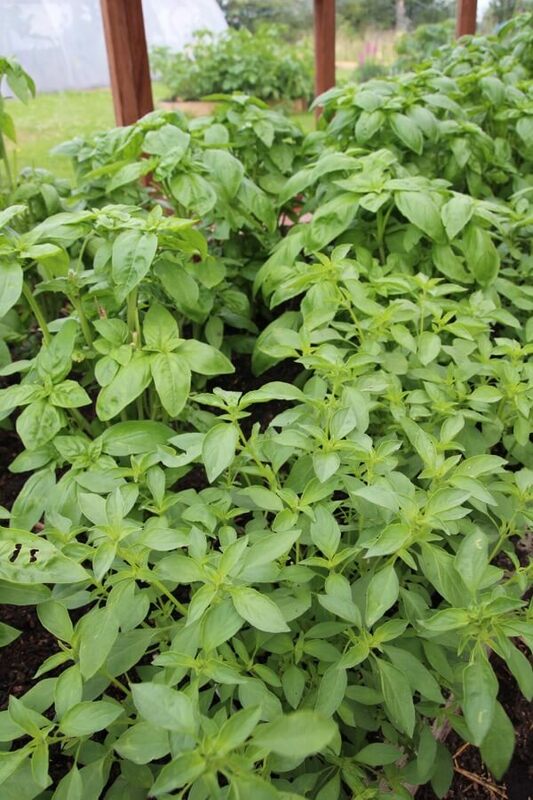 Now they are large plants and it’s the other way around: basil needs plenty of water to grow new leaves. 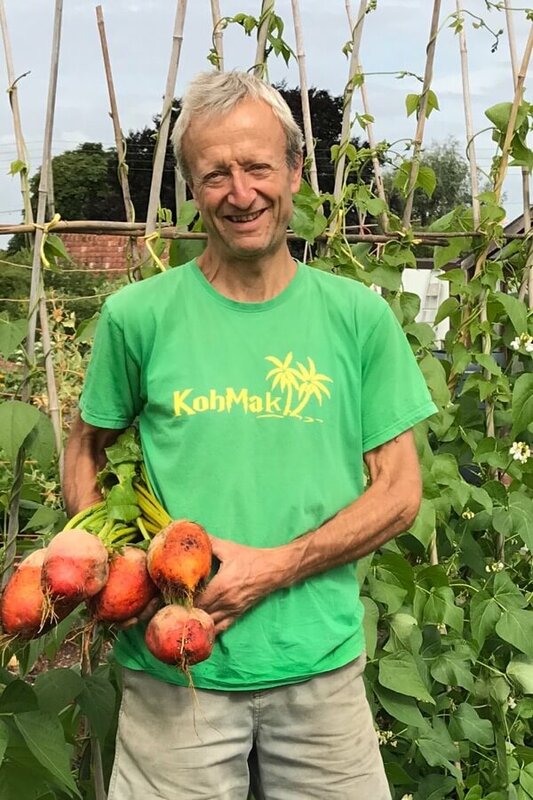 The warm weather (see aubergines last para) has encouraged rapid growth and I was impressed to pick 2kg/4.4lb of new shoots on 11th July, eight days after the last picking on just 25 plants. 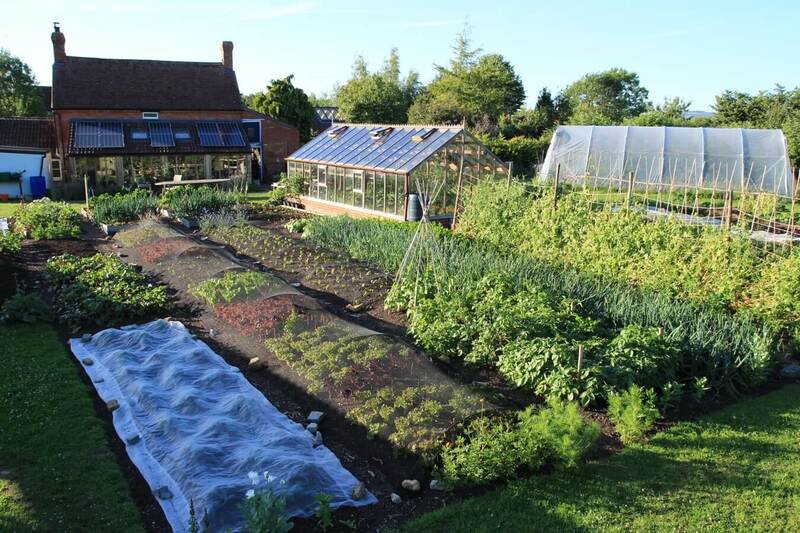 The sowings of late winter and early spring are now rising to flower so my second tranche of sowing on 1st June, planted 26th, is coming ready at the right time. 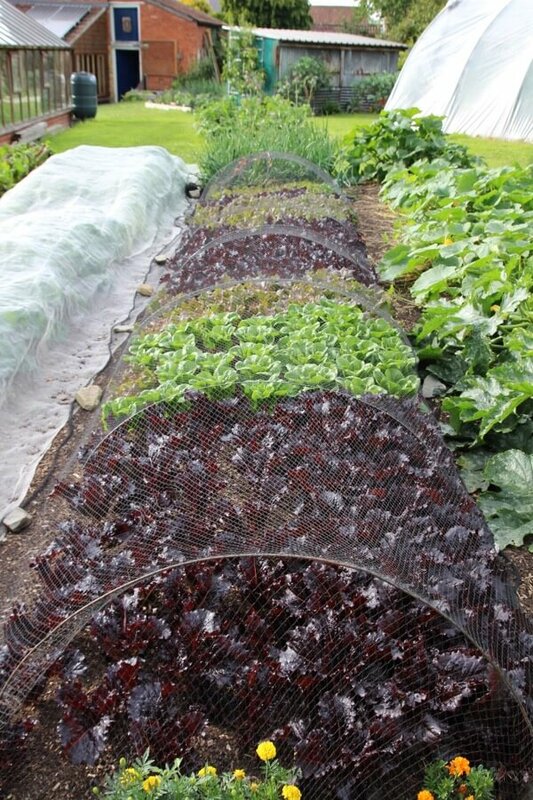 These lettuce should give weekly harvests until mid or end September, as long as the root aphid does not affect them too much. The only remedy I know for that is to have a back-up of endive! Also to grow resistant varieties such as Navarra. I am not sowing any rocket or oriental leaves until early August, so they are less holed by flea beetles, and crop for longer through autumn. 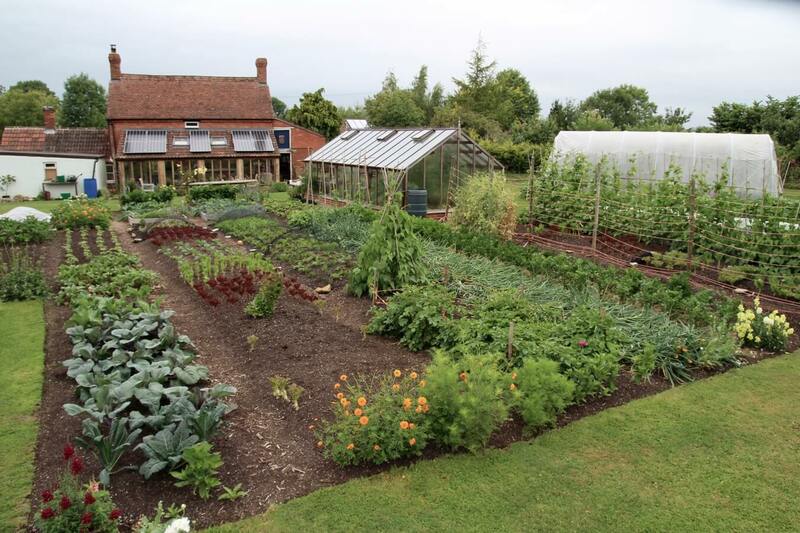 We just had another super review of No Dig Organic Home and Garden from Vera Greutink in the Netherlands, whose own garden is both work of art and highly productive. 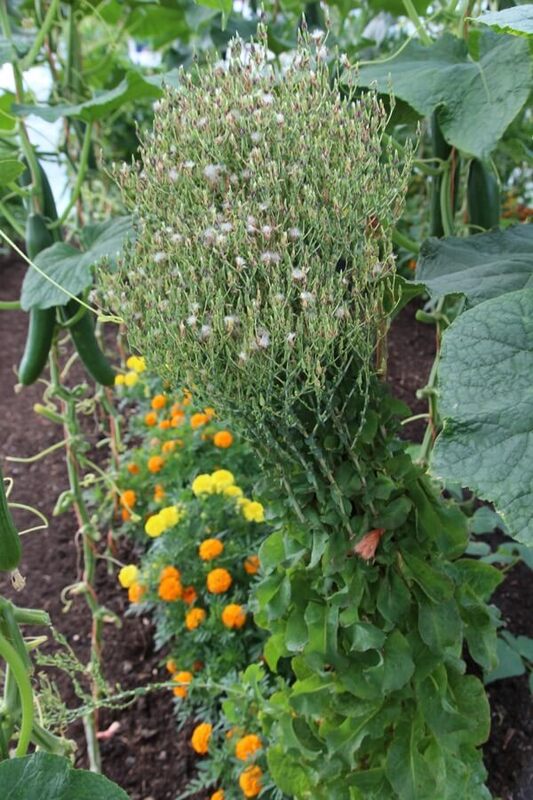 In the review she mentions the chapter on seed saving, and that is now topical – we just harvested pea seeds from almost-dry pods (dry enough, not yellow but the pod is leathery) while lettuce in the polytunnel is flowering. 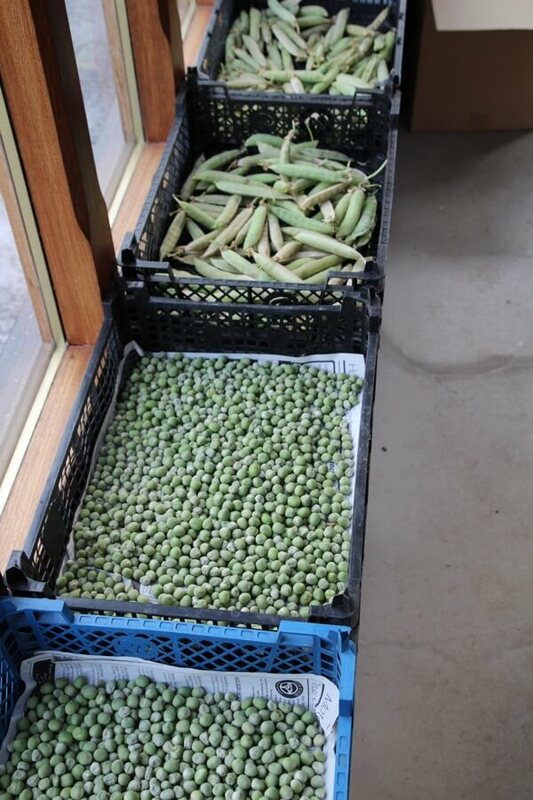 Broad beans are starting to dry as well, I am saving de Monica whose flavour has impressed. Alderman peas shelled, good to eat and good to seed! Plants need leaves to photosynthesise, to bring growth and flavour to fruits, and ripening is not about sunlight on fruits. However it’s good to cut off some lower leaves because they photosynthesise much less than the new leaves up top. 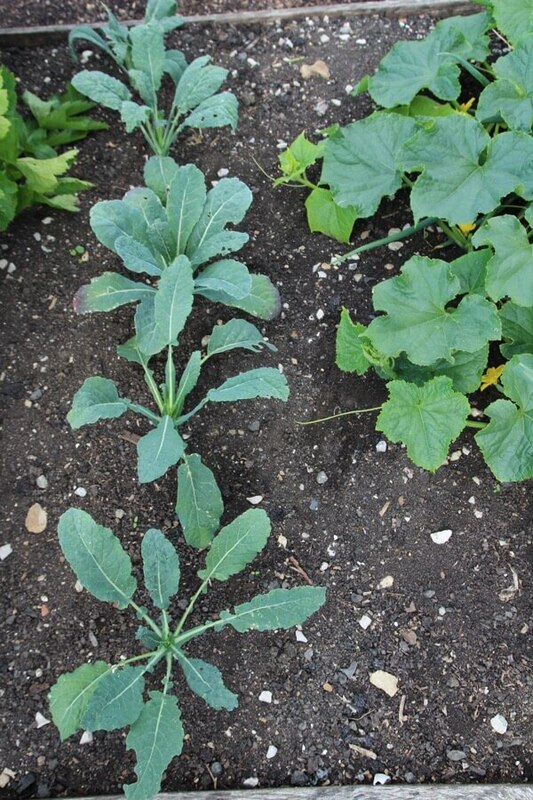 Then it’s easier to water without wetting leaves, which means no blight on plants undercover. Here is a clear description of fruit growth, and tips for best flavour, which I found in Gardens Alive. “The fruit slowly loses the green colour of its chlorophyll as the carotenoids and lycopene that give it its final colours begin to develop. 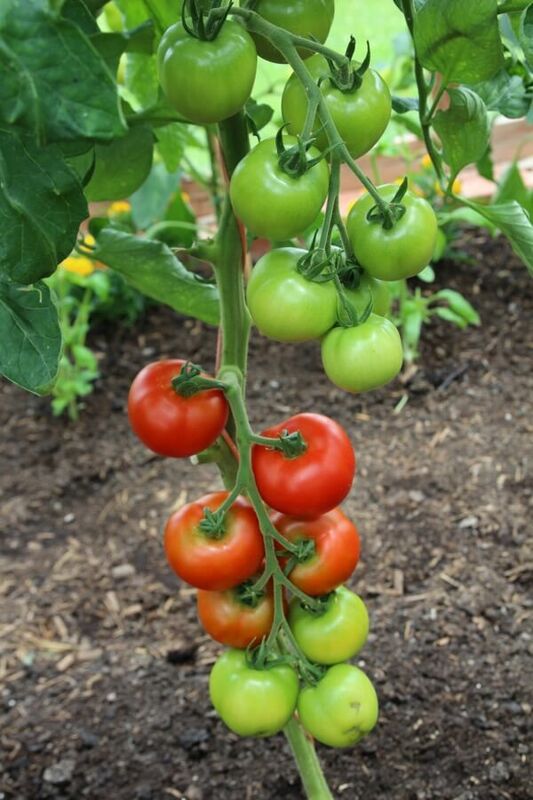 Most ripening tomatoes go from a deep green to a lighter green, then almost yellow. 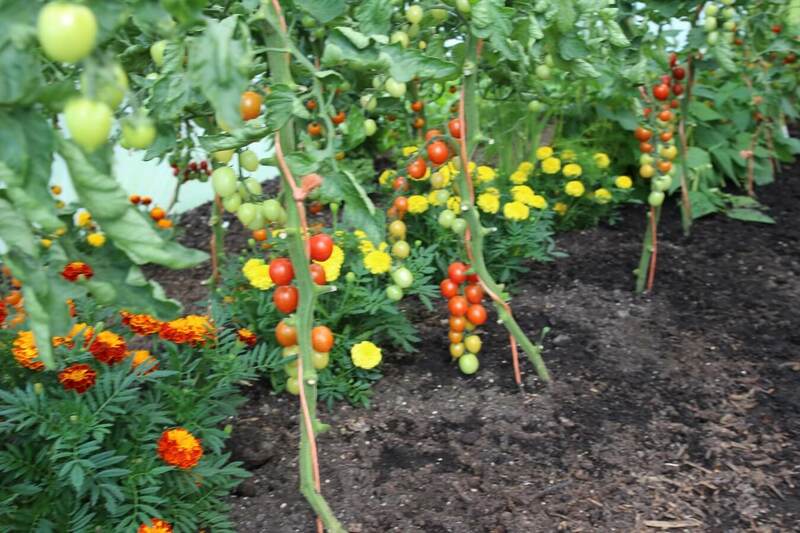 Tomatoes that are destined to be red when ripe will first develop a few pink streaks down at the blossom end, while tomatoes that are destined to be yellow when ripe will begin by becoming a brighter shade of yellow. These tomatoes are at what’s called “the breaker stage”. 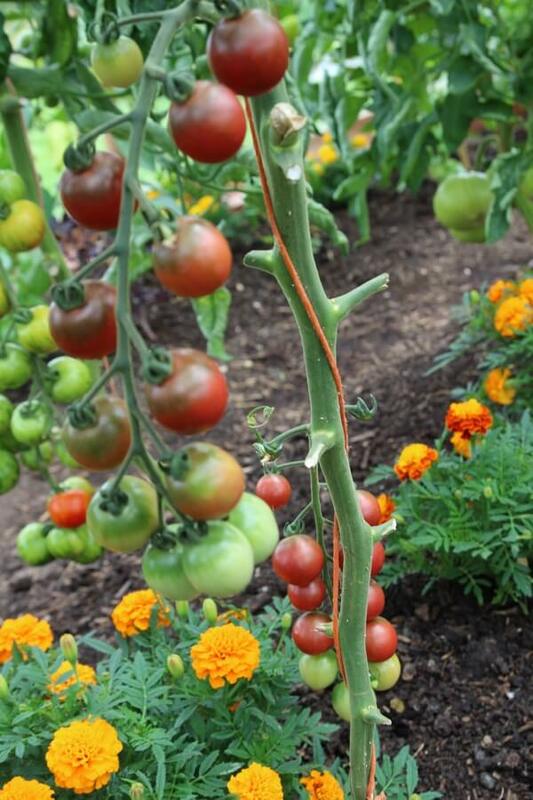 And tomatoes that have reached the breaker stage will finish ripening up off the vine with full flavour or close to it—as long as you don’t mess up. One way to ruin things is to put the tomatoes in “a sunny windowsill”. I’ve been warning people about this for the past 26 years: only the leaves of the plants need sun, not the fruits. In fact, placing your ripening tomatoes in direct sun can cook the flavour right out of them. The same thing happens if you don’t pick ripe tomatoes promptly outdoors; they can lose a lot of flavour sitting out on the vine once they’re dead ripe. The other extreme to avoid is a chill. A Food Scientist at the University of Maryland quoted in that OG story warned that ripening tomatoes will taste mealy and have little flavour if they’re exposed to temps below 55 degrees F. The ideal temperature for ripening breaker tomatoes indoors, we are told, is between 60 and 65 degrees. That’s why you should never put any tomatoes in the fridge. Ever ever ever! 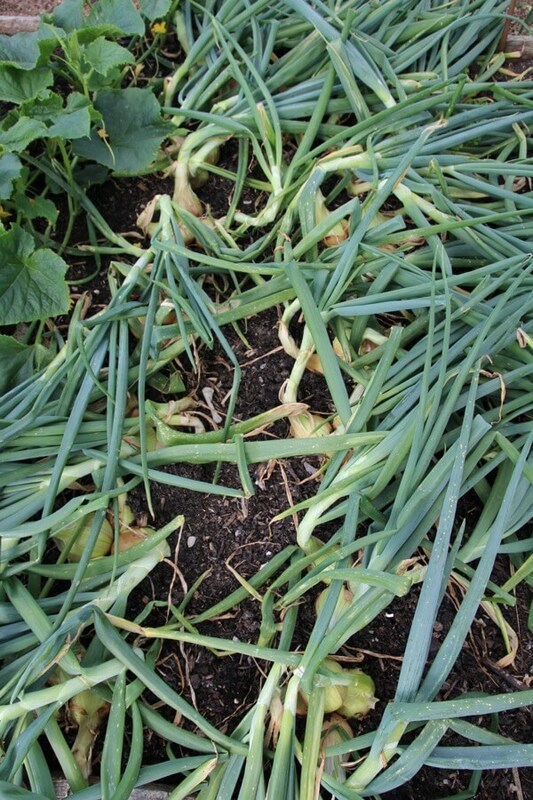 I am excited about onions this year, how they have loved the sun and dry air. Pick them for immediate use any time from now, especially if grown from sets. 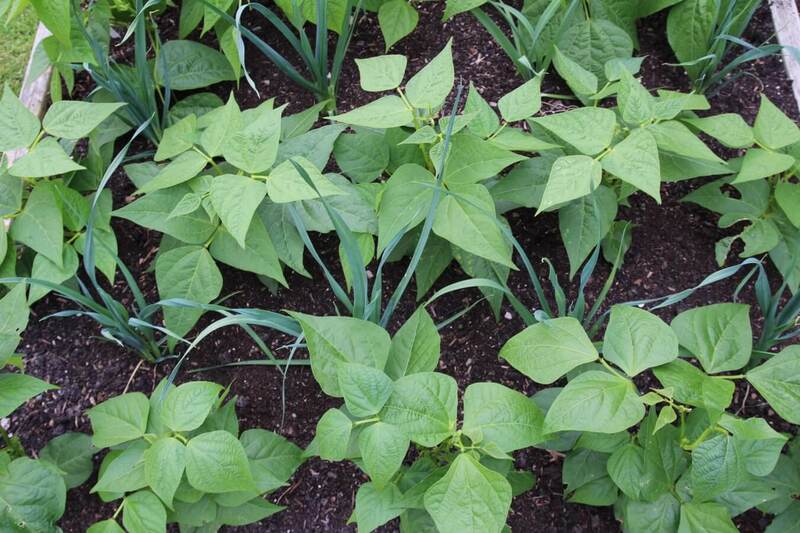 Multisown clumps from seed take a little longer than sets to reach full size, and one clue they have managed that is that most leaves are lying flat. 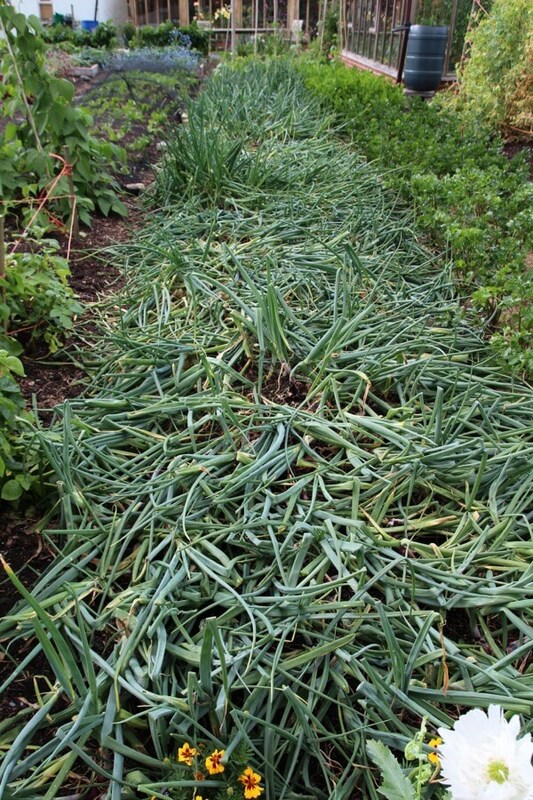 If your onion leaves fall over when bulbs are small, they are not going to grow much more, leave perhaps a week before pulling to dry. 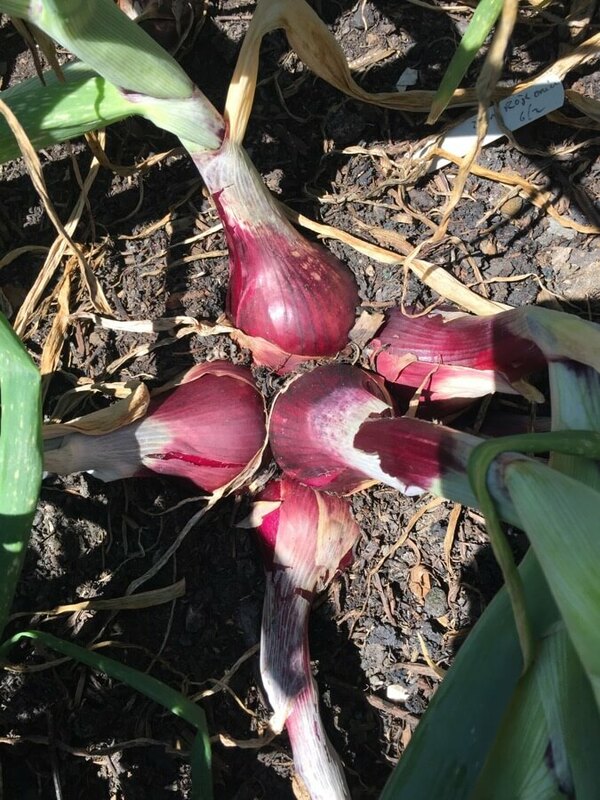 Onions need a full season (sow undercover mid February to early March, or plant sets by mid April), rich soil and full light of possible. My achilles heel in composting is the moisture level. 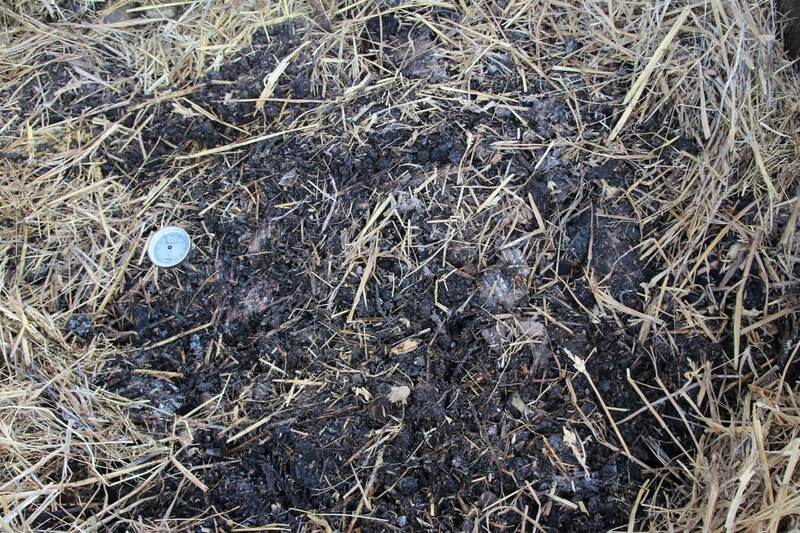 Until there was a roof (erected one year ago), the compost was often soggy with some anaerobic pockets, depending on the time of year. Now and especially in summer, I am veering towards too dry, even with too much heat (65C/150F to 75C/167F). When Finn was turning a heap last week, we needed to water some dry pockets. Turning is so useful for highlighting such issues. 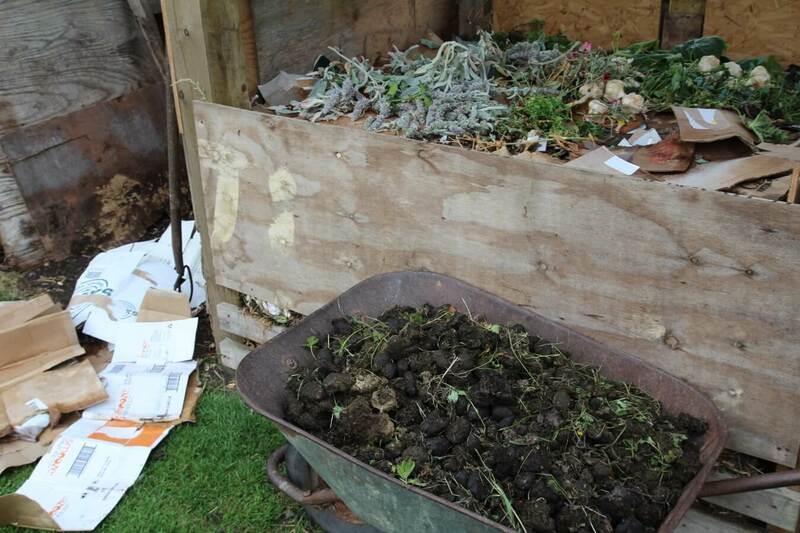 Even better, we found the trowel I dropped into this heap in April. And better again, my neighbour Clare appeared with a barrowload of fresh horse manure from the neighbouring field. Some of it is going on the heap with extra cardboard. 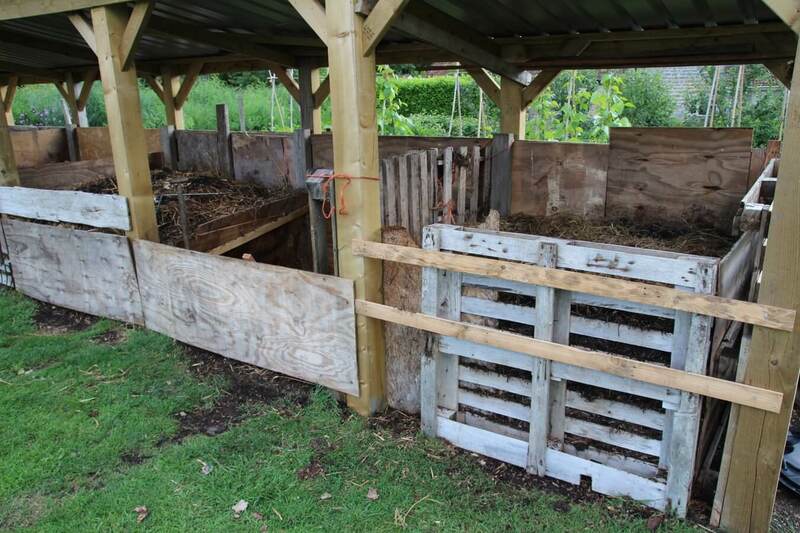 Copper trowe after three months of hot composting! Wow your aubergine looks splendid. First year for aubergines for me. They are in the greenhouse which I am beginning to close at night now they are chilly. Only 2 inches long, though; is there time for them to finish? Well done Hazelky. 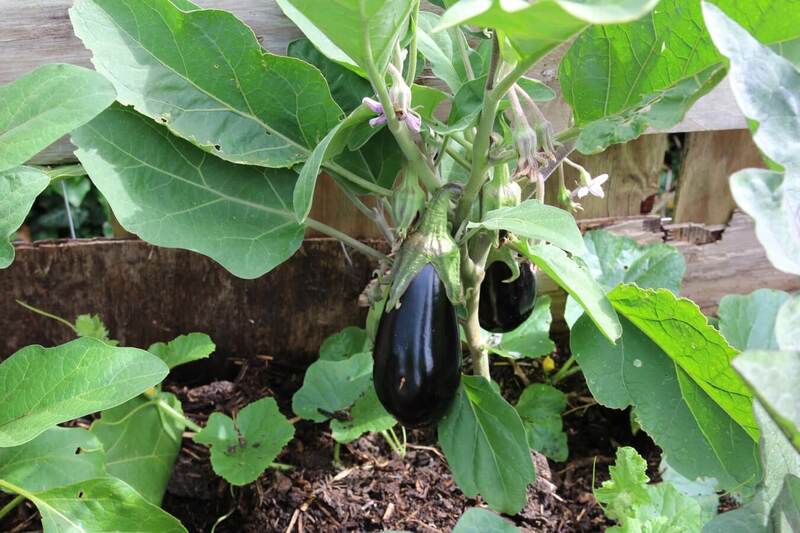 Ripeness of aubergines is not measured in length – some varieties grow to 4in/10cm and others to three times that at maturity, which also depends on soil fertility and age of plants. Look for swelling in the middle, skin colour changing from shiny to matt – both indicate seed formation and loss of juiciness. Pick before that ideally, it takes practice.